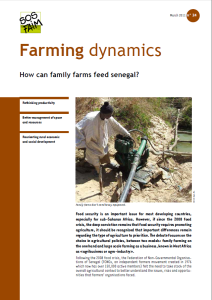 How can family farms feed senegal? Food security is an important issue for most developing countries, especially for sub-Saharan Africa. However, if since the 2008 food crisis, the deep conviction remains that food security requires promoting agriculture, it should be recognized that important differences remain regarding the type of agriculture to prioritise. The debate focuses on the choice in agricultural policies, between two models: family farming on the one hand and large scale farming as a business, known in West Africa as «agribusiness or agro-industry».